How To Find A Medicare Advantage Plan With The New Supplemental Benefits : Shots - Health News To help seniors stay healthy and independent, some Medicare plans will soon cover things like home-delivered meals or rides to the doctor, but finding plans that include the coverage is not easy. 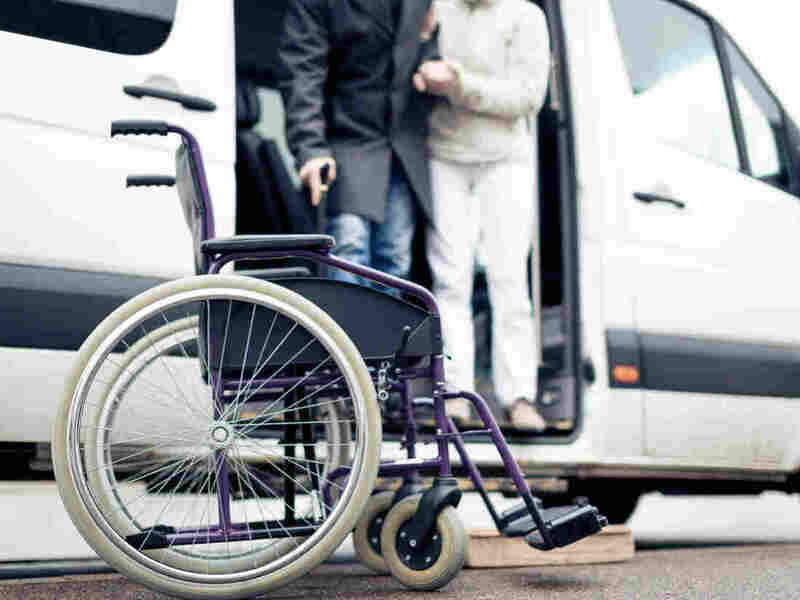 Services like rides to the doctor or wheelchair ramps are among those that some Medicare Advantage plans will begin to offer next year. For some older adults, private Medicare Advantage plans next year will include a host of new benefits, such as transportation to medical appointments, home-delivered meals, wheelchair ramps, bathroom grab bars, or air conditioners for asthma sufferers. But the new benefits will not be widely available, and they won't be easy to find, during this fall's enrollment period. Medicare officials have touted the expansion as historic and an innovative way to keep seniors healthy and independent. Despite that enthusiasm, a full listing of the new services are not available on Medicare's web-based "plan finder," the government tool used by beneficiaries, counselors and insurance agents to sort through dozens of plan options. Medicare officials see the added benefits as a key to helping Advantage members prevent costly hospitalizations. Federal approval of new supplemental benefits is "one of the most significant changes made to the Medicare program," said Seema Verma, the head of the Centers for Medicare & Medicaid Services, at an insurers' meeting last month. She added that she expects plans to expand the number of services in coming years. Medicare Advantage plans, which are an alternative to traditional Medicare, serve 21 million beneficiaries and limit their out-of-pocket expenses. But they also restrict members to a network of doctors, hospitals and other medical providers. They often offer benefits not available in traditional Medicare, such as dental and vision care, hearing aids and gym memberships. The federal government pays the plans to help cover the cost of each member. Enrollment is underway now for choosing a Medicare Advantage plan, as well as for people in traditional Medicare who want to buy a policy for drug coverage. The deadline for both plans is Dec. 7. Trips to the pharmacy or fitness centerin addition to doctor's appointments for plan members, depending on where they live or their health conditions. Doctors or other health care providers who make housecalls, under certain conditions. A home health care aide for a limited number of hours to help with dressing, eating and other daily activities, sometimes including household chores and light housekeeping. However, plans offering these services will likely have only some of the options and will have different eligibility criteria and other limitations. Advantage members will need a recommendation or referral from a health care provider in the plan's network. Then they may need to have a certain chronic health problem, a recent hospitalization or meet other eligibility requirements. Also, the same services likely won't be available in every county the plan serves. For example, next year Humana Medicare Advantage members in Texas and South Florida in just two of the 43 states Humana serves will be able to get a free in-home personal care aide for up to 42 hours a year if they can't be left alone at home. And more than half of the members in Cigna-HealthSpring Advantage plans will have access to free transportation services in all but five of the 16 states and the District of Columbia where the company sells coverage. To find these supplemental benefits, seniors can go to the online plan finder. After they enter their Zip code and get a list of plans available locally, they can click on a plan name. That will take them to another page that offers more details about coverage, including a tab for health and drug plan benefits. That page might say whether the new services are offered. But often the website will simply say that some benefits are available and advise consumers to contact the plan for more information. "There is a lot of information on the plan finder, but there is a lot of information missing that requires beneficiaries to do more research," says Deb McFarland, Medicare services program supervisor at the Southern Maine Agency on Aging. There are also other variables to be considered when choosing an Advantage plan, such as which health care providers and pharmacies participate in a plan's network, what drugs are covered and costs. Where available, however, several insurers say the services will be free with no increase in monthly premiums. "We certainly believe that all of the ancillary benefits we provide will help keep our members healthy which is good for them and it's good for us in the long run," said Steve Warner, head of the Medicare Advantage product team at UnitedHealthcare, which insures about 5 million seniors or one out of every four Medicare Advantage members. Dawn Maroney, consumer president at Alignment Healthcare, which serves eight counties in Southern California, says it's much cheaper to give an air conditioner to someone with congestive heart failure to keep that patient healthy than to pay for expensive medical treatment. But if the new benefits are such a good idea, they should be available to the majority of older adults in traditional Medicare, says David Lipschutz, a senior policy attorney at the Center for Medicare Advocacy. Medicare Advantage plans have extra money to spend on benefits next year because the federal government increased its payments an average of 3.4 percent, seven times more than the rate of increase in 2018. For free help with Medicare Advantage and drug plan enrollment, contact the Senior Health Insurance Information Program (www.shiptacenter.org) or the Medicare Rights Center (800-333-4114 or www.medicareinteractive.org). Find Medicare's Plan Finder at www.medicare.gov/find-a-plan/questions/home.aspx or call 800-633-4227.